"Casa Grande" shares the back yard of "Casa Pequena" on Calle 6. 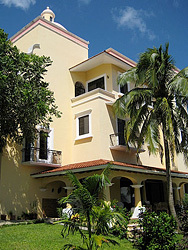 It is located about one and a half blocks from the ocean and about two blocks from the town square. It is within easy walking distance to all of the downtown restaurants and shopping. There is a swimming pool just a few steps from the porch on the ground floor. It's perfect for those hot afternoons any time of the year. See photos of Casa Grande. "Casa Grande" is truly a big house, but it is made for a small group. The owners live in this house 2 - 4 months per year, so it has limited availability. The "Big House" has a master bedroom on the second floor with one king-size bed. The MBR has a bathroom with a tub and a separate shower. The MBR has a private balcony. 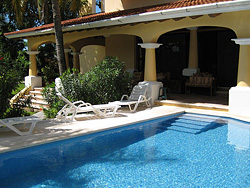 We recently added 2 studio apartments to Casa Grande. Each one has a queen size bed, a bath, and its own kitchen. The downstairs studio has its own entrance from the outside, perfect for your friends who always seem to be on a different schedule. Above the MBR is the "party room." This floor has a large balcony with a wonderful view of town and the ocean. There is a bar and another bathroom with a shower. The party room has two couches that can be used as single beds, and there is an actual single bed in the corner, turning this into a back-up bedroom. Above the party room is the highest sundeck on the island. You are at the height of a six story building, and on top of a small hill, giving you an incredible view! The entire town spreads out below you. The sun deck has built-in lounge chairs. Because no one can look down on you, you are guaranteed the best all-over tan in Mexico. There is a kitchen with refrigerator, glass-top electric stove, a toaster oven, and a microwave. There is a complete set of cookware, plates, glassware, cups, and silverware. A purified drinking water dispenser is provided in the kitchen and the party room. The water in the faucets is fine for washing and bathing. The bedroom and the party room are airconditioned. The party room is so high that usually you can open the windows and catch a fresh breeze. There is a very large, lush tropical garden in front of the house, perfect for afternoon margaritas. Because of the many balconies and stairways in this house we must insist on NO SMALL CHILDREN PLEASE. It is perfect for two couples who want a taste of luxury. Our caretakers are Chipita and Teresa. They visit frequently to provide maid service and general problem solving at the houses. Click on the photos for a photo gallery with captions. Click the right side of each photo to advance.